Virtual Distro Dispatcher (VDD) is a distributed system whose aim is to project virtual, fully operational and multiple operating system instances on terminals in a network. Client terminals can be obsolete PCs or energy saving thin clients (such as mini-ITX) managed by a powerful, multiprocessor (and possibly clustered) central system. Desktops are instantiated on a server and then provided to thin clients on demand across a network. It is possible to define such paradigm as a Desktop-as-a-Service (DaaS) solution: desktops can be transformed into a cost-effective, scalable and comfortable subscription service. VDD gives users the possibility to enjoy their own favourite operating systems, including those that are not Open Source, possibly at the same time, on each single thin client. Thin clients are interfaces to proper and isolated machines, that can be made to measure for whatever need and in whatever number (within server limits, of course). This is completely transparent to users, who, even from an obsolete machine, can select a particular machine with certain characteristics and then do absolutely everything they would do on such a machine as if it was physical and with its defined performance. 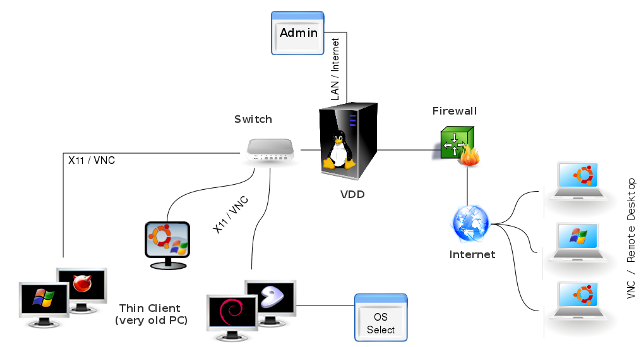 Contrary to other systems, like LTSP (Linux Terminal Server Project) the VDD offers not only the host operating system to thin clients, but projects virtualized guest systems, i.e. fully operational and independent machines.